Scenic views make great dorm room decorations! Scenic views are great dorm wall art items for two reasons. First, your college may not have much of a view. In fact, your view may be a bunch of other buildings, and sometimes those buildings may be right next door so you can't see anything else. That's not very inspiring for your college dorm room decor or for your creative process when you're in the middle of a long, tough English essay. Second, your dorm room walls, well, they aren't going to give you much of a view either. They're going to be a dull color that may detract from your dorm room decorations a little bit. The solution? 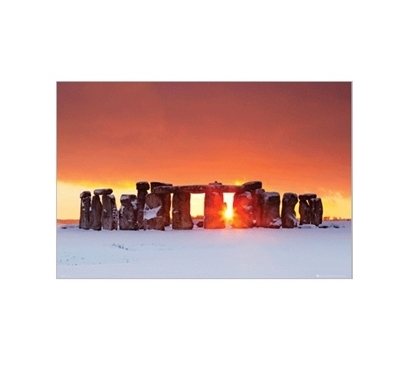 Adding dorm wall art that offers you gorgeous scenic views like our Tom Mackie Stonehenge College Poster! Our Tom Mackie Stonehenge Dorm Poster is a simple photograph but that doesn't make it any less gorgeous. This dorm essentials item features a beautiful orange and yellow sunrise over Stonehenge. You can see the sun peeking through the stones of Stonehenge for a unique and amazing view that will brighten up your dorm room decor. This college supplies item also features Stonehenge covered and surrounded in a light blanket of snow. The contrast between the colors in this dorm wall art item makes this a stunning addition to dorm room decor!